Hiking the Ladder of Kotor promises awe-inspiring views and the chance to get off-the-beaten-path in tourist favourite, Kotor. 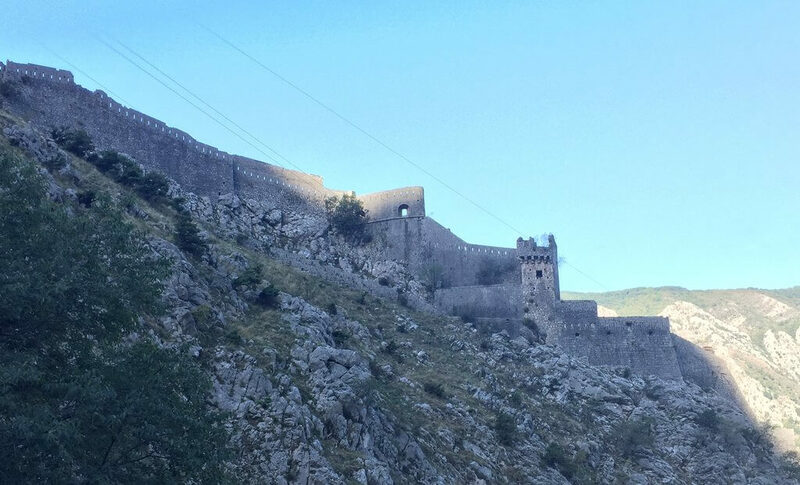 The Ladder of Kotor, also known as the Ladder of Cattaro, Kotor’s Venetian name, is an old military trail, built by the industrious Austrians who built many of Montenegro’s roads. The road connected Kotor and Montenegro’s royal capital, Cetinje, and was used by families bringing their produce to sell at the market in Kotor. 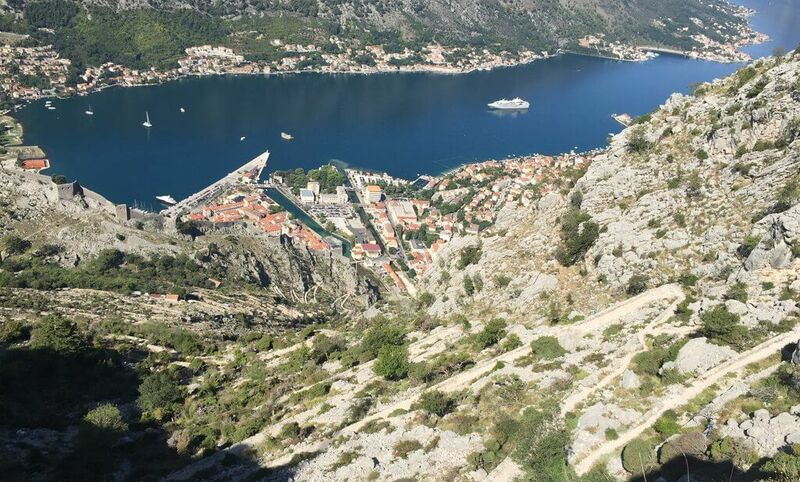 You can hike the Ladder of Kotor and I highly recommend it for keen hikers, nature-lovers and photographers. If you’re in reasonably good shape you’ll have no trouble walking this path and you’ll be rewarded with the ultimate views of Kotor Bay. This is as off-the-beaten-path as it gets in touristy Kotor! The path for the Ladder of Kotor starts at the start of the Skurda River, just a few minutes’ walk from Kotor old town. There are over 70 switchbacks on the path and it’s in pretty good condition for its age. It’s certainly easier to walk than the slippery steps of San Giovanni Fortress, which is a shorter and much busier hike up the same mountain. The Ladder of Kotor is a longer hike, but it’s actually easier because you’re walking a flat path rather than climbing steps. The path is wide and relatively easy going, and it’s not long until you get views of Kotor Bay and the outside of San Giovanni Fortress. 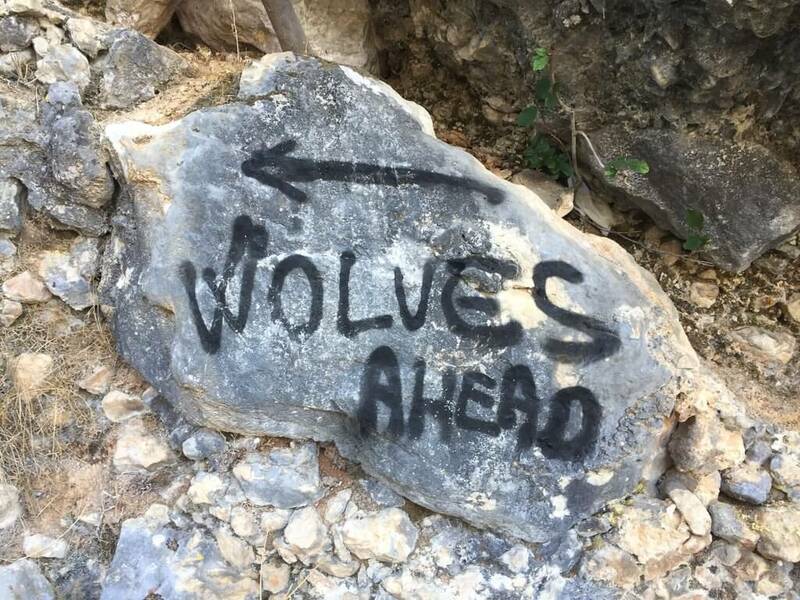 A spray-pained sign warns of ‘wolves ahead’ but rest assured there are no wolves this close to Kotor. 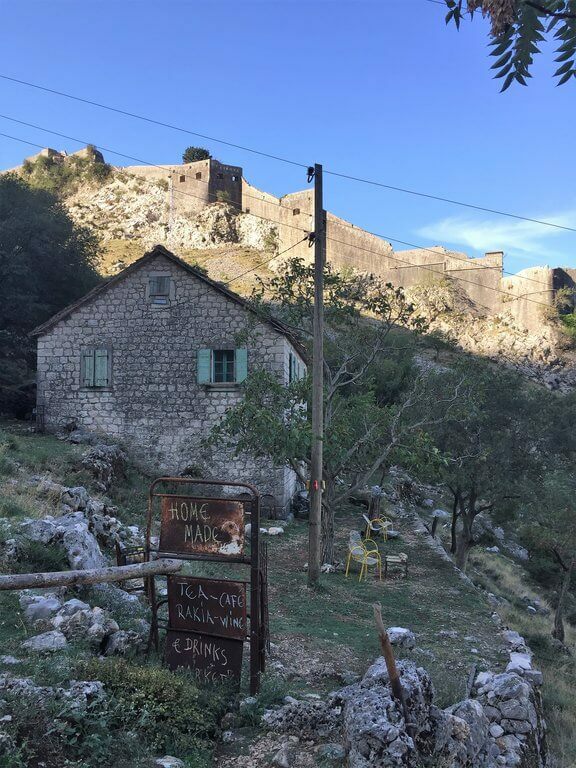 If you want to take a break there’s an old house offering tea and coffee, or wine and rakija if you need something stronger to fortify yourself for the rest of the climb! There’s another place further up, where the path splits and you can either continue to the top of the Ladder of Kotor or branch off to San Giovanni Fortress. It also offers drinks, cheese and prosciutto. This is where the path splits and you can turn off for Spiljari village and San Giovanni Fortress. If you turn off here, you'll come to the ruins of Spiljari and its 1,000 year-old Church of St John. From there you can follow a narrow path to San Giovanni Fortress, which is the Kotor walls walk that starts in Kotor old town. If you keep going up the Ladder of Kotor you'll be rewarded. The views just keep getting better. A few more switchbacks and you'll find yourself above San Giovanni Castle and its towering walls. That's when the views open up and you'll be able to see the Bay of Kotor flanked by mountains on all sides. 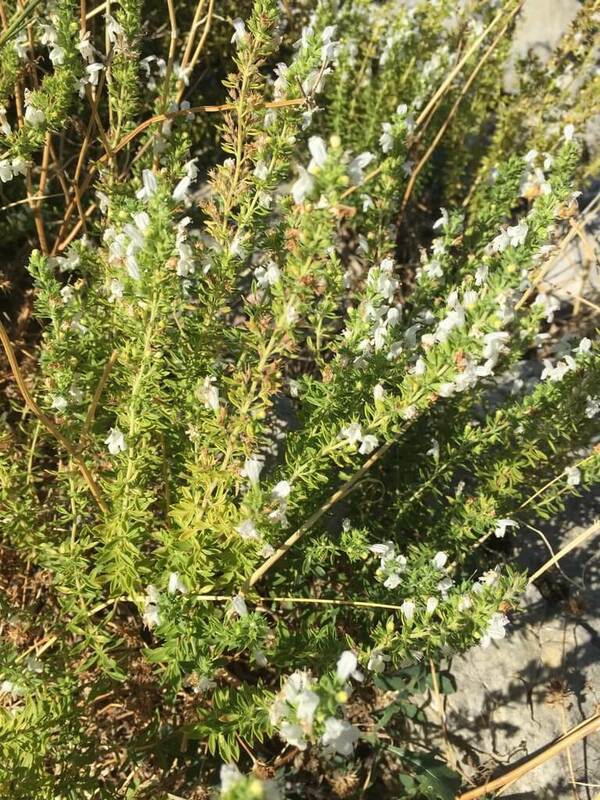 The path is flanked by grasses and you can’t mistake the scent of wild thyme that fills the air. You might even meet some local residents up here. A glance back the way you came is a little dizzying, but shows just how far you’ve climbed. At the top you’ll get the incredible views you hiked all this way for. And boy are they worth every step. 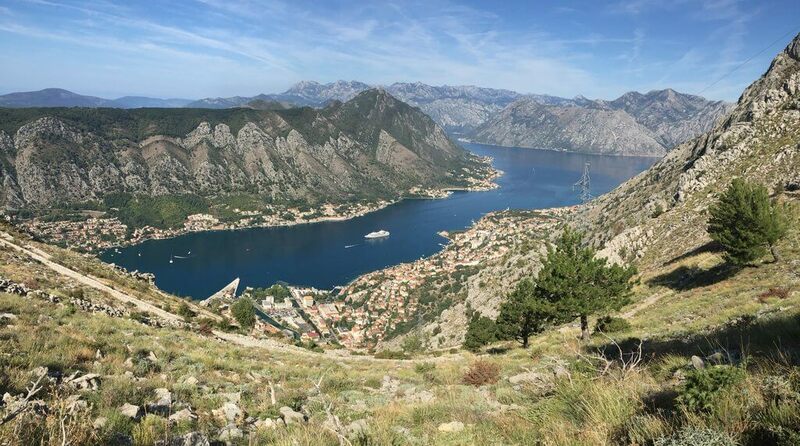 Far below, you’ll see the triangle of Kotor, with its terracotta roofs, jutting out into the Bay of Kotor. The cruise ships that look so enormous when you’re standing next to them, from here are more like tiny, white toys floating in the deep blue of Kotor Bay. You’ll also see Vrmac Ridge directly opposite and begin to appreciate why Montenegro got its name ‘Black Mountain’. There are rugged and inhospitable mountains as far as the eye can see. This is the perfect place to break out a picnic and enjoy the majestic views in all directions. This is the top of the trail and you can stop here and return to Kotor. But you can also continue on through the forest to where the trail ends on the road in Krstac. You'll, rather conveniently, come out close to a restaurant called Nevjesta Jadrana (Bride of the Adriatic). It's the ideal place to grab a pivo (beer), refuel with some proscuitto and cheese from nearby Njegusi village and enjoy the views. From here, you'll be able to see the whole Bay of Kotor out to the Adriatic Sea. You can hike the Ladder of Kotor on a guided tour that starts from Kotor. On this tour you hike down the path rather than up, so it's easier than hiking up from Kotor and back down again. 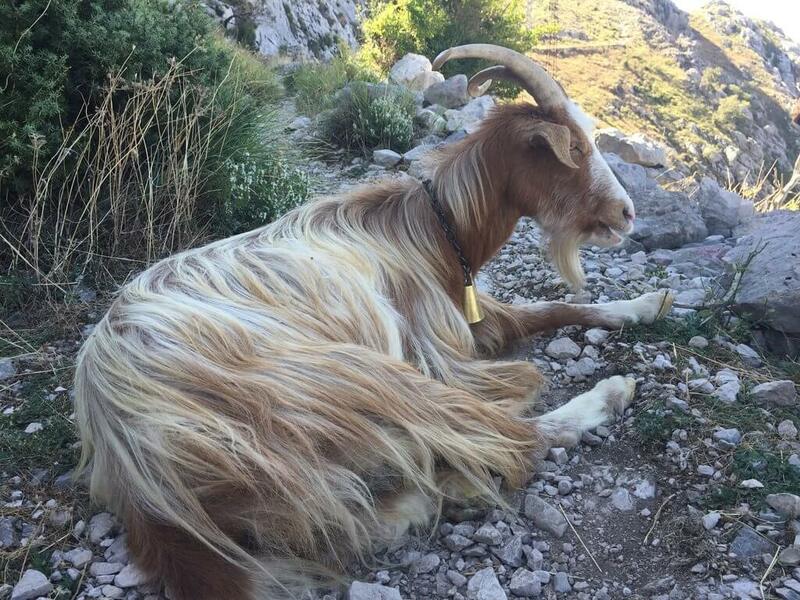 On the tour you're transported up the serpentine road from Kotor to Njegusi village, famous for its proscuitto, cheese and for being the birthplace of one of Montenegro's favourite leaders, Petar Petrovic-Njegos. 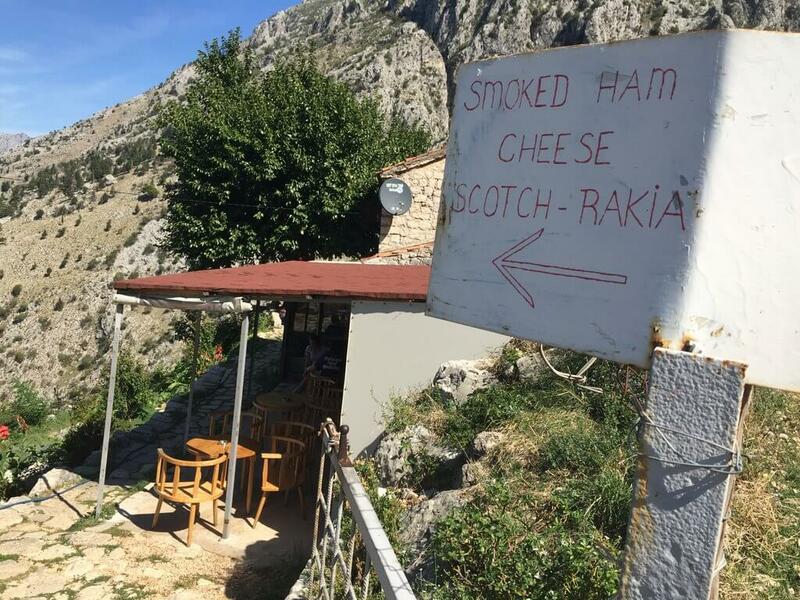 It's also home to Montenegro's oldest restaurant. You have time to visit the village and pick up some tasty specialties for later, before starting the walk down from Krstac. You can also mountain bike down the Ladder of Kotor on a guided tour. The tour starts from Kotor and you get driven up to Njegusi village. Then you spend around 1 1/2 hours cycling down, with plenty of photo stops on the way. You can return to Kotor via the same path to the Skurda River. Or you can come down via San Giovanni Fortress. From the top you head back down the way you came and head towards the little place selling prosciutto and cheese. At the junction, follow the path towards the fortress and it will take you to the ruins of Špiljari village. There, you can explore the crumbling, thousand year old Church of St John and the ruins of the village. The path continues to a literal hole in the wall and leads to the San Giovanni Fortress hike. 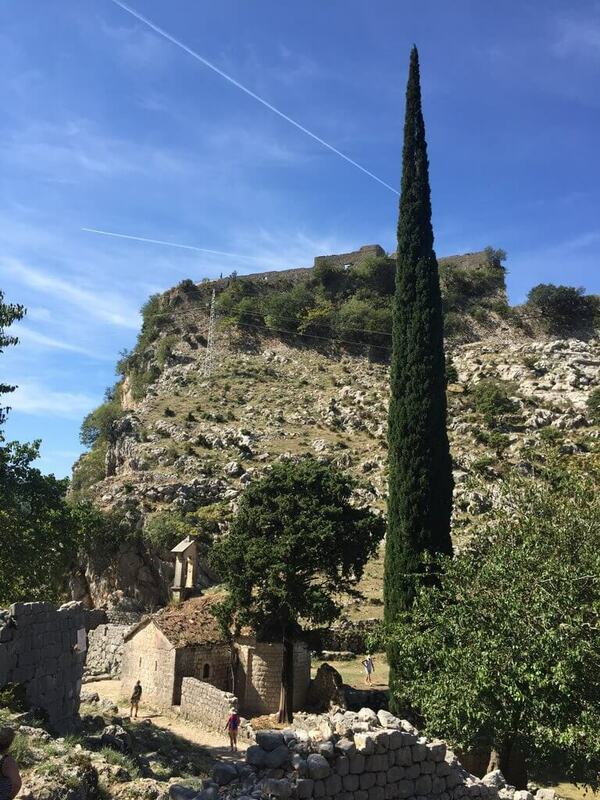 You can head up to San Giovanni Castle or head down to Kotor old town. The San Giovanni hike is a popular tourist attraction and it’s significantly busier than the Ladder of Kotor. It’s also single file steps and you have to walk on a steep path of gravel a lot of the way. 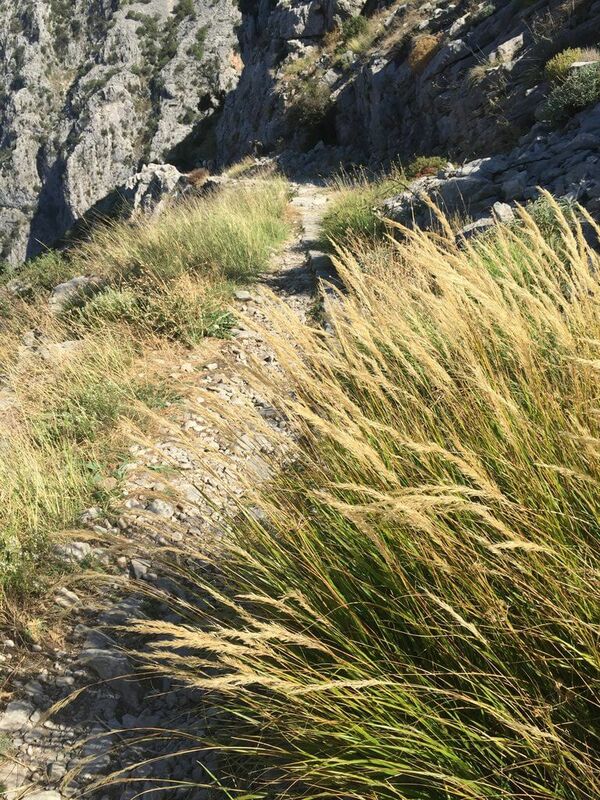 We preferred the Ladder of Kotor path, but taking this route allows you experience both trails in one hike. If you’re not keen on uphill climbing, you can just walk down the Ladder of Kotor. Get a transfer or taxi to the top of the trail in Krstac. You’ll drive up the serpentine road from Kotor, with its 25 hairpin turns) towards Njegusi village. The trail is marked (number 759) and starts off passing through forest, before opening up to grassland. Follow the switchback trail down to Kotor. Best time to do it: In the morning, before it gets too hot. Morning to early afternoon will give you the best photos of Kotor Bay. Any time of day in the winter months. Kotor is one of Montenegro's top tourist attractions and places to stay, so there's lots of great tours and activities you can do from here. A Kotor walking tour is a great way to get to know the town's history and culture in just an hour. There's no better way to see the Bay of Kotor that from on the water. Take a three-hour speed boat tour to the top attractions or spend all day swimming and exploring on a full-day cruise. Take a full-day tour around Montenegro. This tour packs an unbelievable amount in just 12 hours. It's perfect if you haven't got much time in Montenegro or your own rental car. Go rafting in the Tara Canyon, the deepest canyon in Europe and one of the most beautiful places in Montenegro. 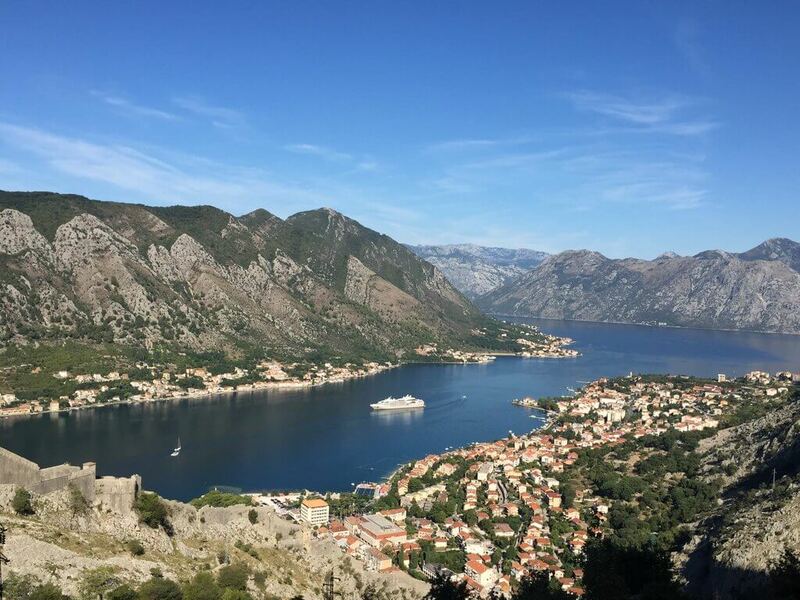 Kotor's compact size and proximity to other popular destinations, like Budva and Cetinje, make it a great place to base yourself during your stay. Stay inside the old town for atmospheric boutique hotels, apartments and hostels. Or enjoy the seaside charm along Dobrota and Muo, while still being within a stone's throw of the old town's restaurants and bars.